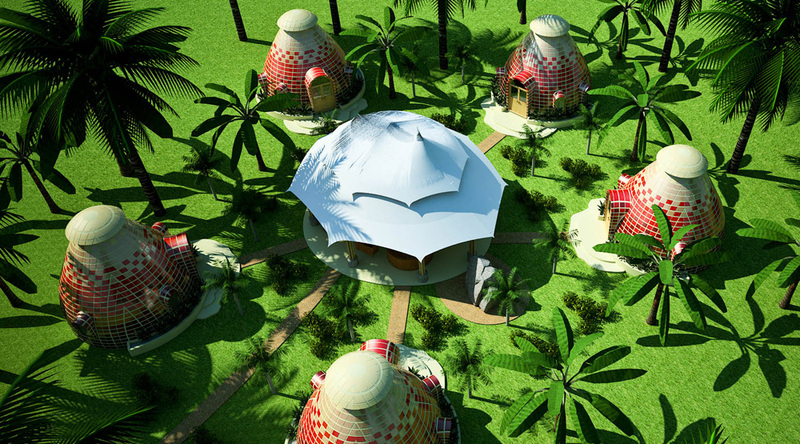 Houses in the Mindfulness Project, a planned sustainable community in Thailand, are grouped in clusters of five with a bamboo gazebo in the center and two Solar Vaults (1. mechanical room, shop; 2. toilets, showers, laundry) in the nearest clearing. This cluster shows Insulated Earthbag Domes. Some clusters will have Domed Roundhouses (an exciting new design coming soon). All houses are joined by paths covered with wood chips. Actual tile work, which is inspired by the work of Gaudi, will be much more beautiful than shown.